The Dean Valley, between the Stockbridge and Dean Village, is an important and much loved area of Edinburgh's New Town, which was planned and built from 1767. It has significant cultural, national historical, architectural and designed landscape value, and is outstanding scenically in views from the streets, bridges and houses, and in the valley itself. The Dean Valley is one of the finest and most significant picturesque landscape gardens in Scotland complementing the built townscape above it, the two integral to the 18th century ideals of the Enlightenment. 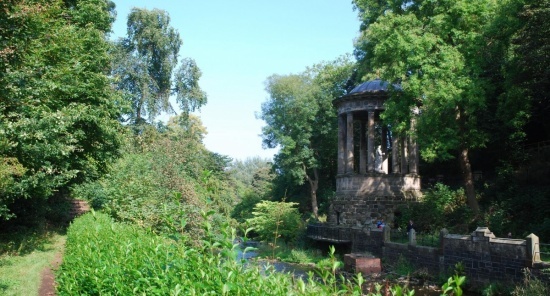 St Bernard’s Well, (1787) a copy of a Roman temple dedicated to Hygieia, was recently restored by Edinburgh World Heritage Trust. The design is based on the temple at Tivoli, outside Rome, and this idealised landscape is seen in many fine landscape paintings in art galleries in Edinburgh and elsewhere. The well is open to visitors in the summer months staffed by volunteers from Dean Village Association. The Association also hosts walks describing the social and economic history of the area and activities linked to the Open Doors programme. Through the 19th and early 20th centuries the valley became an important industrial landscape through harnessing the water to power water mills. Three other significant elements of the landscape are the Dean Bridge, Randolph Cliff and the arched retaining structure to the Moray Gardens. The bridge and retaining structure are beautiful structures designed by Thomas Telford. The current landscape includes planting that has been added to over time and has inevitably become mature and overgrown, impacting on the growth of planting between it. The climate has also changed with typical annual rainfall figures being far higher than what it was in the early 20th century. This has significantly impacted on the drainage down the sides of the valley and onto the public areas. The City of Edinburgh Council has completed the first phase of a major flood defence project downstream from Stockbridge to Leith with the construction of flood defences. 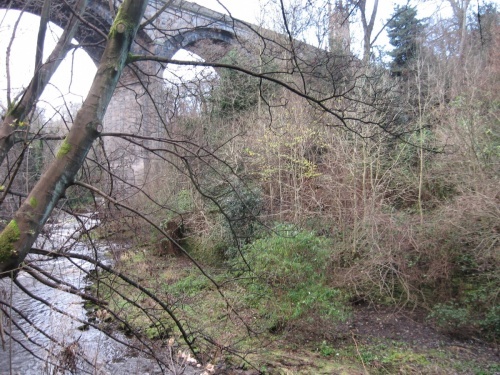 Within the project area the Water of Leith, its banks, the river bed and the footpath and cycle-path are owned by the City of Edinburgh Council. It is bordered on both sides by areas of private gardens, the Moray, Dean and Belgrave Gardens, forming a beautiful backdrop to the public areas. There are also two additional areas of private land. The first of these is in Dean Terrace, a strip of land which is owned by a now dormant private company. The nature of the holding company has resulted in no maintenance being undertaken and has relied on the City of Edinburgh Council intervening. There is a legal process that can be implemented to transfer the ownership and on-going maintenance responsibility to the City of Edinburgh Council. 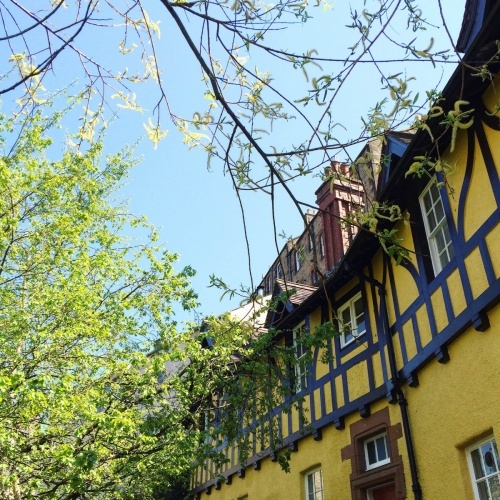 The second area of land in private ownership is in Dean Village on the river frontage to Miller Row, and is owned by Link Housing Association. The City of Edinburgh Council has maintenance responsibility for the area it owns, including addressing essential maintenance for public safety and the removal of damaged or diseased trees. 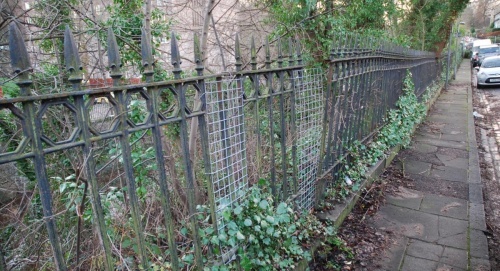 Day-to-day maintenance is otherwise covered by a management agreement between the City of Edinburgh Council and the Water of Leith Conservation Trust, which relies on the generous involvement of volunteers. Local residents and volunteers have also been undertaking ivy clearance particularly in Upper Dean Terrace. 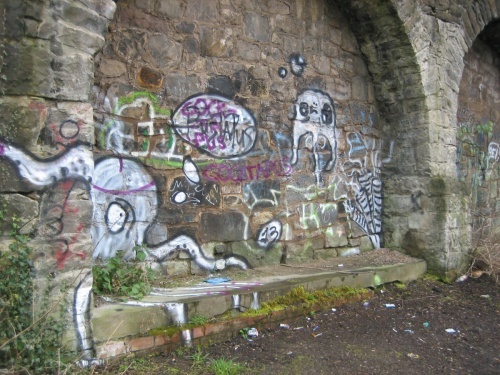 There are health and safety hazards to the walls fronting the Water of Leith, which currently prevents periodic maintenance. There is tree growth in the river bed and in these walls potentially undermining the stability of the embankments and sides to the river. Evidence of this is where pavements and the footpath and cycle track have become uneven with tree root development. This limits full public access particularly for those with restricted mobility. 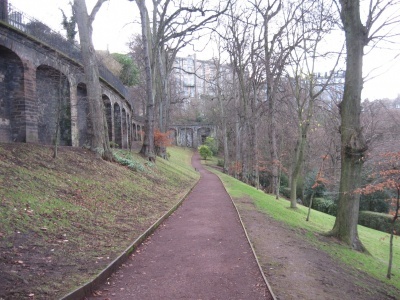 The walkway though Dean Valley is part of the 12.25 miles long Water of Leith Walkway that runs all the way from Balerno to Leith. All parts of the public footpath and cycleway are very popular and the Dean Valley walkway is no exception. Read more about the users of the walkway and paths. The renovation could include the walls, bridges, railings and embankments, the removal of trees where these are undermining the structure of the embankments; and the restoration of the walkway and cycle path as well as planting up areas which are currently bare. Selective removal of trees would reduce the level of overgrowth, reintroducing daylight into the areas currently in shadow and allow for a far greater level of plant and wildlife biodiversity, and additional planting of shrubs and small trees would improve the overall appearance, as well as re-establishing certain key views in the planned designed landscape. Replanting can also deliver carbon savings, since younger trees deliver better carbon capture. The project also might develop other carbon savings, green energy options and a possible business strategy to generate income to offset future maintenance costs. An earlier feasibility study was undertaken for a small scale hydroelectric turbine at Lindsay’s Mill, and we have separately investigated the potential for a cafe and visitor centre as a sustainable environmental and interpretation facility nearby. None of this would be possible without detailed discussion and negotiation with the Council and compliance with a number of current policies. Ultimately we would need to obtain statutory consents from the City of Edinburgh Council. 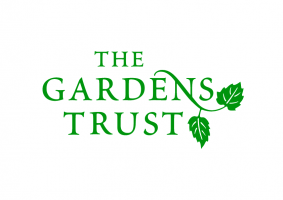 The longer term legacy the project might deliver is regeneration of a unique resource, and by doing so, firstly act as a community focus and improving the shared amenity, and secondly promoting its cultural significance and sustainability and self-sufficiency for current and future generations. This partnership model might be applied to a potential replica project from Dean Village to the Gallery of Modern Art steps, and elsewhere. 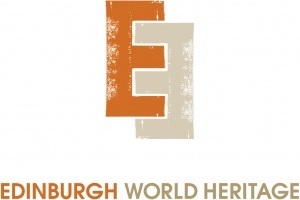 The first stage involved secured funding for and preparing a Conservation Statement in 2015, commissioned by Edinburgh World Heritage Trust, and funded by Historic Scotland. Other funding came from Inverleith Neighbourhood Partnership and a generous donation from a private individual. A copy of the Statement is available at Stockbridge Library and an online version is available here. We held a public meeting at Stockbridge Library in February 2015 where we presented the initial findings of the Conservation Statement. At that meeting there was consensus about us establishing a small working group to develop matters further. This group has met on a monthly basis and has identified an outline work plan and the necessary actions needed to take the project forward. We set up Dean Valley Regeneration, as a charitable company in September 2015. This was made possible through a further generous donation by a local resident. 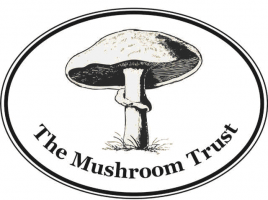 We applied for charitable status because of the tax benefits that accrue, and the opportunity this allows to attract trust funding. By setting up the company we aimed to support the City of Edinburgh Council and others to undertake activity for which there is no existing funding. We are currently finalising a partnership agreement with the City of Edinburgh Council to provide us with a mandate to further develop the project. We held a further public meeting in October 2016 and have spoken to various potential funders, targeting those who support projects with a community based focus. At the same time we have spoken to the Neighbourhood Partnerships, Community Council, groups of residents and schools. We have also been carrying out survey work including monitoring the pattern of use of the public walkway and cycle path using technology loaned to us by Living Streets. We have undertaken a biodiversity scoping document for the Dean Valley, which was completed in July 2016. The document was commissioned by us with funding from the City Neighbourhood partnership to review nature conservation issues and linkages to the Edinburgh Local Biodiversity Action Plan. We have also completed a review of private land ownership. We have also been awarded a £5,000 grant from SUSTRANS (Sustainable Transport Scotland) to match £2,000 raised by us at a fundraising event and a £3,000 grant under the City of Edinburgh Council cycling development grants. This funding will be used to meet the costs of reviewing footpath and cyclepath options as part of a wider feasibility study. The next stage is to develop the fuller feasibility study, resulting in more detailed proposals for local residents to comment on in 2017. This work, subject to securing additional funding to employ consultants, will look at the design and cost options for the project and should position us favourably to support City of Edinburgh Council to secure capital grant funding, including a possible application to the Heritage Lottery Fund. At this point the detailed opinions of the community will be sought. All of the options have to be deliverable and therefore the City of Edinburgh Council will have to approve these. Likely funders of the project also need to be reassured that there is significant buy-in from the community.